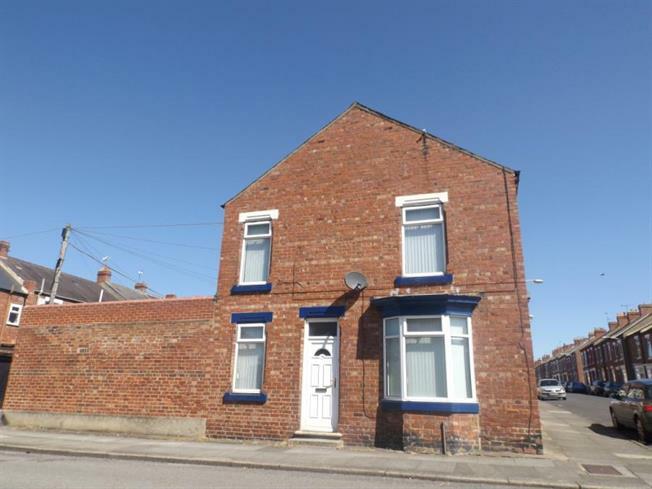 2 Bedroom Terraced House For Sale in Darlington for Offers Over £60,000. Ideal Investment or First Time Buyer Opportunity! Currently Tenanted until September 2019 at 400pcm. Well presented two bedroom end of terrace home, situated in the popular Denes area of Darlington. Well located for many amenities and transport links. The property itself comprises of; entrance hall, lounge, dining-kitchen, utility room and bathroom with two bedrooms to the first floor. Externally there is a walled courtyard to rear. Double glazed entrance door to the front elevation and stairs leading to the first floor. Double glazed bay window to the front elevation, ceiling coving, picture rail, wooden fire place housing electric fire, television point, telephone point and a radiator. Fitted with a range of wall and base units with work surfaces overincoporating a single drainer sink unit, built-in gas hob with extractor hood over, built-in electric oven, combination boiler, part tiled walls, laminate flooring, under stairs storage, two double glazed windows to the front and side elevation and access into utility room. Double glazed door to the rear elevation, fitted wall and base units, space and plumbing for a washing machine and laminate flooring. A white three piece suite comprising panelled bath with shower over, pedestal wash hand basin, low level WC, heated towel rail, extractor fan, part tiled walls, laminate flooring and a double glazed window to the rear elevation. To the rear of the property there is a court yard with walled boundaries and gated access.